In this hospital single-bed patient rooms employ evidence-based design with conveniently located large handwashing sinks, noise-reduction materials, ample space for families, bathroom located on the headwall (close to the bed to reduce falls), and expansive windows. The room is acuity-adaptable to reduce patient transport, and offers patients control of temperature and variable lighting options. 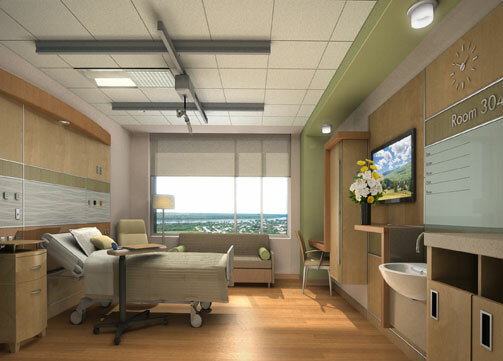 The patient's view from the bed includes a care board, large TV monitor, plant shelf, artwork, and casework that conceals soiled linen and trash carts. A ceiling-mounted patient lift reduces staff injuries.